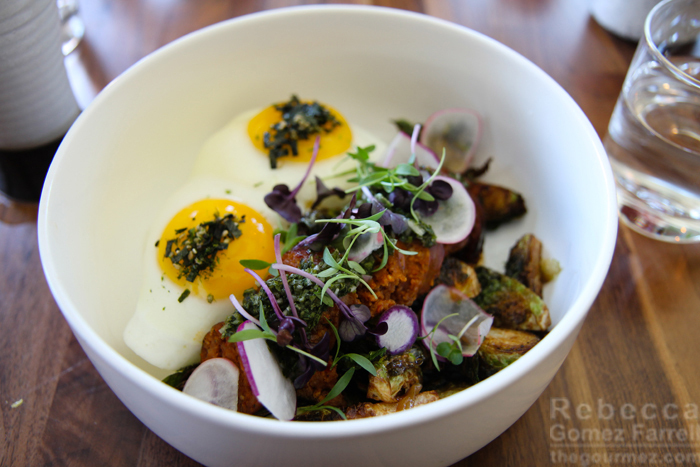 My food-writing friend, Jennifer Ng, joined me for brunch at ‘āina recently. Jennifer is the author of the Ice Cream Travel Guide, a book that explores the best ice cream shops worldwide and the stories behind the people who built them. 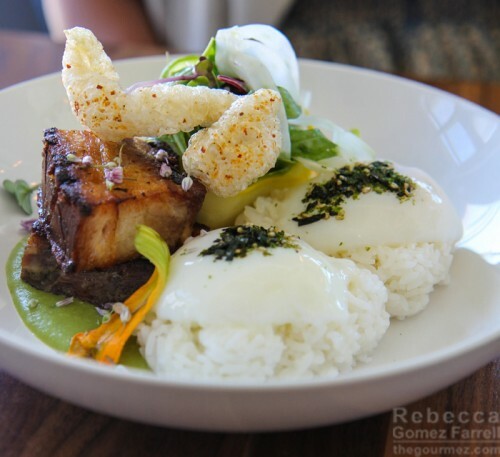 I’ve been discovering that Jennifer’s foodie knowledge isn’t limited to ice cream, and she suggested ‘āina, picking a Hawaiian restaurant with Portuguese influences that she’d tried in its former incarnation as a pop-up. 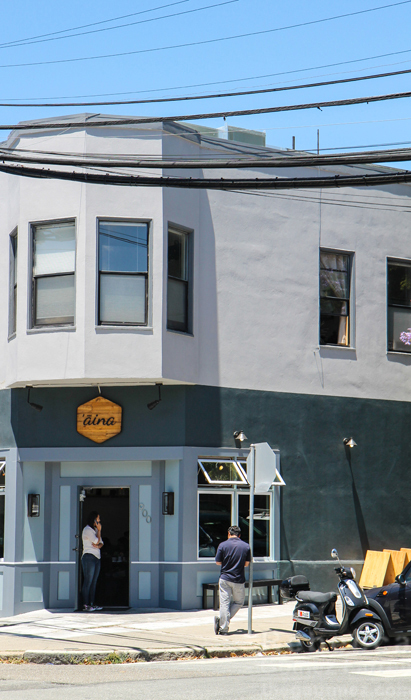 This was my first time in the Dogpatch neighborhood, and I gaggled at all the food shops making homes in its former and current industrial strips. The restaurant immediately won me over with its cool blue interior full of succulents and excited diners. It’s only open during brunch hours, and I highly recommend making a reservation, as the small space fills up fast. The menu mostly consists of fancy, farm-fresh variations on the loco moco, a staple of Hawaiian cuisine that features rice, fried eggs, meat (usually hamburger), and gravy piled together in a bowl. ‘āina’s versions don’t always have gravy, but they do more heavily feature vegetables, which I consider an improvement. The meats currently range from locally made spam to kalbi short ribs. Taro french toast and chicken katsu in omelet form also make appearances. 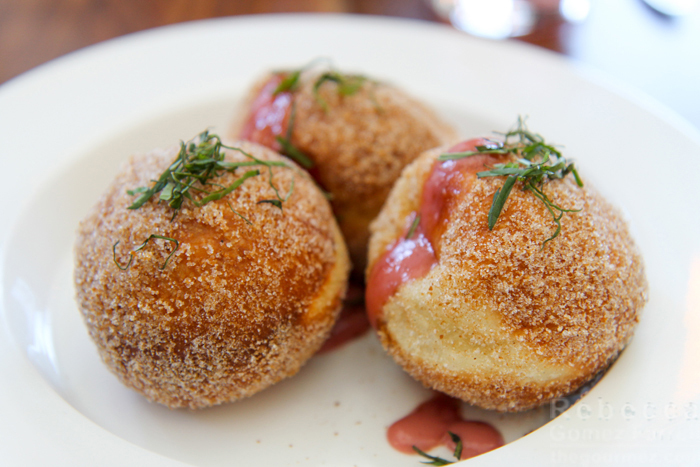 We started with malasadas, Portuguese-style donuts dusted with light and dark coconut sugar and filled with guava custard. They assuredly won me over. The fluffy texture reminded me of beignets, which are my preferred donut variation. Beautifully round, these balls burst with delicious guava custard just like the Fruit Gushers I loved as a kid. We soaked up every drop we could until, sadly, no donut remained. But our main courses did. Jennifer was quite happy with her Kalua Pork Belly, featuring slow-poached eggs, pickled onion, fennel puree, shaved squash, basil, and arugula with rice. She’s admittedly not a fan of bitter leafy greens and found that the amount in this dish was just right. She also loved the pork belly, which was fall-off-the-bone tender had there been a bone to fall off of. I only like my pork belly crisp, but those of you who love the richness of those fat layers will love this. My Portuguese sausage hash was nearly as delightful. I’ll start with my complaint, which is also a bit of a mystery: the hash could have used more moisture to unite the ingredients, which the sunny-side eggs would have provided had they been cooked slightly less. But I generally don’t like gushing eggs, so perhaps the chef had psychic insight into my preferences and followed them! In any case, extra of the green-garlic salsa verde would also have done the trick, and frankly, the perfectly roasted brussel sprouts and so-fresh sausages earned the price of the dish all by themselves. I cannot find the right words to describe just how awesome those sausages were: medium spice kick, full flavor pork, so juicy. 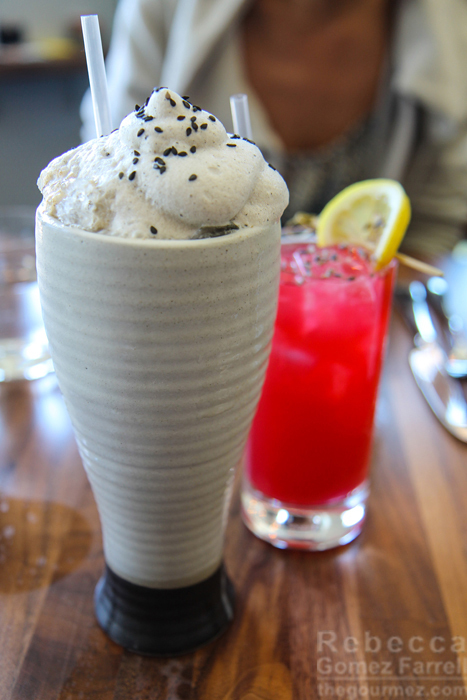 ‘āina’s second specialty is inventive drinks to go with their Islander bent. Jennifer’s nonalcoholic, ginger-hibiscus lemonade satisfied, but she thinks she’d love it with a lavender floral flavor instead. My Hawaiian Vog, on the left, intrigued with that malted, black-sesame-foam scene stealer, which grounded the mixture of lillet, byrrh, earl grey-infused caramelized banana, and spices hiding beneath. Those conjured up an unexpected approximation of a tropical punch for a drink that primarily consists of wine-based aperitifs. I loved the surprise! I also love that ‘āina’s owner, Jason Alonzo, specifically aims for cocktails with low alcohol content, a great goal for a brunch location–who wants to spend the rest of the day all fuzzy brained? Of course, it’s also a practical goal without a full liquor license, but they are certainly making the most of what they have.